Focuses on Commonwealth rarities within the red albums. 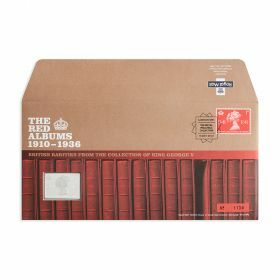 Focuses on Commonwealth rarities within the red albums at the Royal Philiatelic Collection. There are some real rarities from the Royal Philatelic Collection contained in this cover, accompanying the Mackennal and Downey £1 stamp. The centrepiece encapsulated ingot is a replica of the stamp in hallmarked silver by Thomas Fattorini Ltd.